In 1972, at the height of the Cold War, the World Chess Championship took place in Reykjavik. The 29-year-old American grandmaster Bobby Fischer insisted on sitting in a Time Life Chair during the game. He claimed it would help his concentration. His Russian opponent, Boris Spasski, insisted – probably in order not to suffer a „concentration disadvantage“ – that he also sit in such an armchair. It didn’t help, Bobby Fischer won. The Time Life Chair was designed in 1960 by Ray & Charles Eames, as a „favor“ for publisher Henry Luce. He had allowed Eames to use photos from the Time Life Archive for the 1959 designed pavilion of the American National Exhibition in Moscow. To this end, he was given a specially developed chair model that is still named after its first place of use: the Time Life Building. The chairs were used in the publishing offices and at the bottom of the lobby, in an even wider, deeper version. The apparent combination of functionality with luxurious comfort probably also led to the fact that the makers of the US series „Mad Men“ liked to put such a chair at the conference table for the bosses of „Sterling, Cooper“. However, the chairs used don’t seem to fit in with the times: they have a „five-star base“ – which the Time Life Chair didn’t get until the mid-seventies, when the safety regulations for office furniture changed. Probably they couldn’t find enough identical originals with a four-armed base. 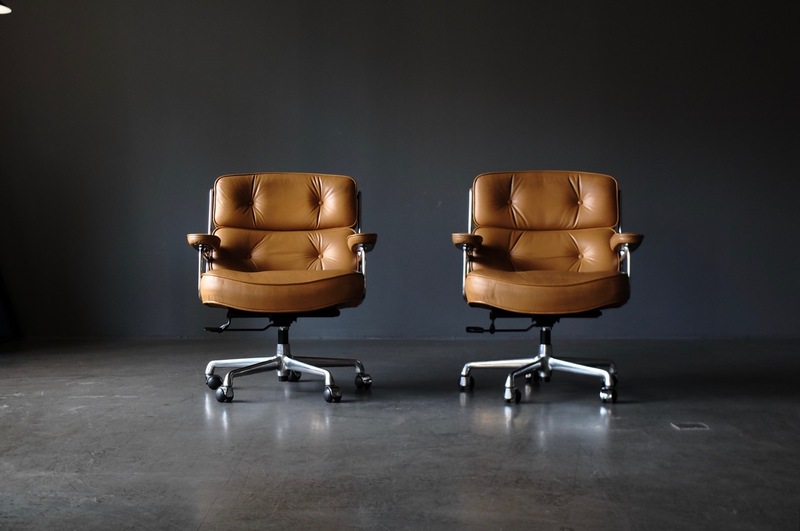 We’ve got just a pair in the showroom, with the 5-star castor base for more safety, swivelling and height adjustable, leather in cognac brown. Produced in the 70ties from Hille International Ltd., one of the four official licensees permitted to manufacture the Charles and Ray Eames designs during the 1960ties and 70ties.